In our writing tips book Alex suggests how important it is to find the right chair to sit in if you are writing a lot at your desk. The chair in the picture would ruin your posture and the hard edge of the saggy cane seat would cut into your thighs. However, the chair’s a classic – reminiscent of the one in those famous paintings by Van Gogh. This week, choose any length for your story, be it a micro of under 300 words or a longer piece. 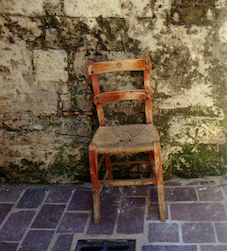 To get you going, consider these few questions – Where is this chair? Who sits in it or used to sit in it? What do they do? What is the dilemma that faces them? Happy writing! And keep checking our website for new events and prompts. This entry was posted in Writing Prompts on August 11, 2015 by Editor.